Around half of Bang & Olufsen's colour TVs in the late 1970's and early 1980's were supplied complete with an advanced remote control handset - the Beovision Video Terminal. It was called a Video Terminal because it did so much more than just switch on the set or change programmes for you. For normal entertainment viewing you simply touched the required programme number. Volume level, colour strength and picture brilliance could be adjusted up and down as desired - or returned instantly to a pre-determined norm by pressing RESET. You could even mute the sound instantly (perhaps if the phone rang) or check through the programmes showing on all the other channels - all at the touch of a single button. The same terminal also controlled Teletext viewing on sets fitted wit the optional Teletext circuitry. And for those who chose to include Bang & Olufsen video cassette recorder (like Beocord Video 8800) as part of their domestic entertainment system, the controls for operating all the primary VCR functions were also right there in your hand. The Terminal let you make recordings, play the tape or wind it to any position without having to move from your comfortable armchair. 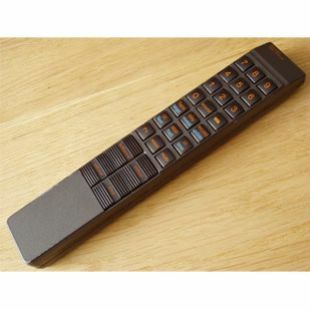 The Beovision Video Terminal was supplied with, for example, Beovisions 5100, 7100 and 8100. The Terminals for other models in the B&O range included all these keys and functions plus three more. Of course, it was still possible to operate a Beovision even if the remote Terminal was temporarily mislaid or out of action. The set's direct controls were mounted in a hinged compartment behind the loudspeaker grille. The panel pivoted outward at a touch and in addition to the direct function controlled governing picture and sound adjustments and programme scanning, it contained the buttons for pre-tuning the buttons. Your dealer could use these to tune the set as part of the installation service. Thereafter you would probably never need to touch them again. 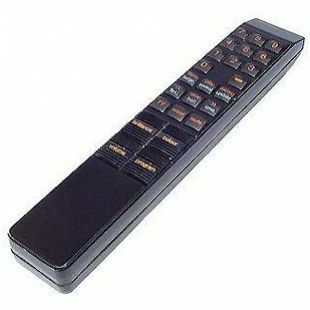 Known for some reason as the Mars bar, this remote is still available from your B&O dealer as an exchange.